One of the questions we are frequently asked is “Is WunderKeys a group program?”. So we thought we’d delve deeper into why WunderKeys Piano for Preschoolers was designed as a one-on-one program. Individual lessons are adaptable – at this age, the difference between one 3-5 year old to the next can be quite drastic in terms of coordination, previous knowledge, attention span, number recognition etc. In a group setting, kids who don’t match abilities with the majority of the class don’t have as many opportunities to have their individual needs addressed as you can in a one-on-one setting. This is a little one’s very first structured musical experience; creating a solid foundation by enriching and adapting as necessary is so important. One-on-one time is important – for most 3-5 year olds, WunderKeys lessons may be the very first opportunity they have ever had to be by themselves with an adult other than a family member. They appreciate this autonomy, and their confidence, verbal skills, ability to show understanding, and focus blossom with the individual attention they receive. For shy children this first experience of being away from Mom or Dad can create feelings of self esteem and pride. Individual lessons foster long-term commitment Group classes can be viewed as a one-time activity that families will sign up for and then move on after it is done. With individual lessons, you are building the foundation for a long-term relationship with your students in the format that you hope they will continue on in for many years. The sense of progression through levels, of creating a teacher/student relationship, and of committing to learning a musical instrument are all fostered through an individually-based program. WunderKeys works with different personalities – Parents find the option of individual classes appealing if they have a shy child, a child who doesn’t focus well in a group-setting, a child with special needs, or a child who simply thrives with individual attention. Not all kids respond well to group classes, and WunderKeys offers these kids a quality musical experience that suits their needs. WunderKeys Prepares Students – After graduating WunderKeys, your little piano students will be already used to the routine of a on-on-one lesson making the transition into mainstream piano lessons seamless. 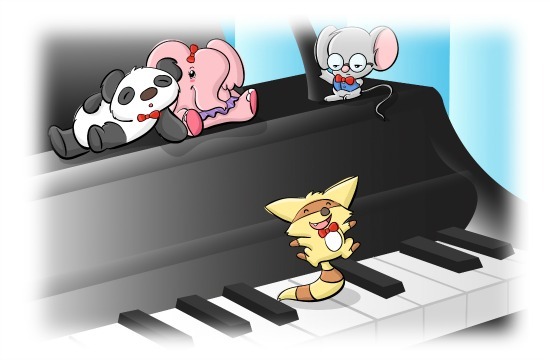 Your studio parents will already know how piano lessons with you “work”. Your little students gain the opportunities to perform on their own rather than in a group setting and you will be guiding the next generation of piano students into lessons in a smooth way. WunderKeys is unique! – There are already so many group class options out there, but WunderKeys allows you go offer something unique to your community. Rather than competing with other teachers in the group-lesson space, you instead have the ability to bring something different to your area that will appeal to those parents looking for an innovative option for their preschooler. Email us today to be registered as a WunderKeys teacher, and enjoy the benefits that being a one-on-one piano teacher for preschoolers can provide!